Spring picnic season is finally upon us (well most of the country anyway) and we couldn't be more excited. Most weekends we pack a picnic basket and head to our local park to meet family or friends and let the kids play until dusk. Ella comes home dirty and exhausted and always sleeps like a champ post picnic. We also do some quick weeknight picnics in our front yard. Even if we just eat leftovers a picnic always rids of us any crankiness (this is especially good for Monday nights). A spring picnic is also a lovely casual way to entertain with grown up friends too. I find myself having girlfriends over for wine and cheese on the lawn more often, because its way cheaper than going out and I don't feel like a weirdo for frequently laughing too loud. 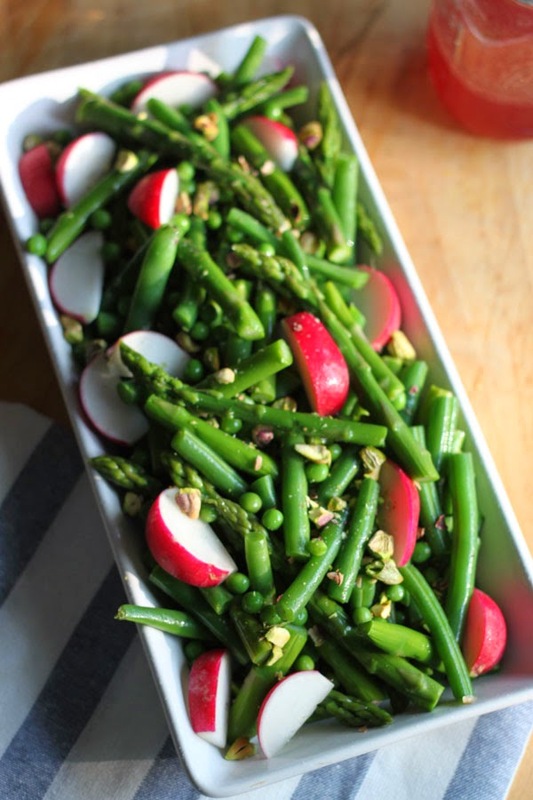 This Super Spring Salad is a perfect dish for a grown-up picnic - it can be served warm, cold, or even room temperature and it one takes one pot and a jar to prep! 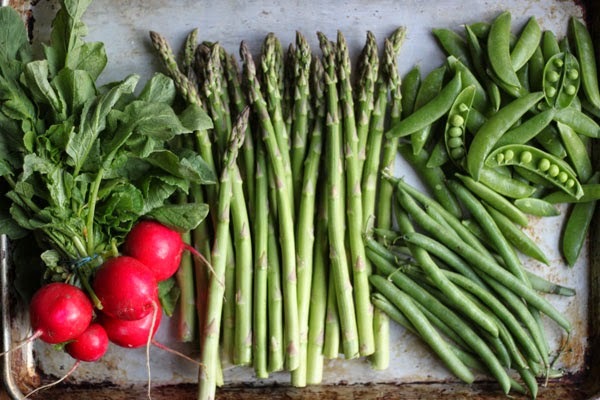 Lauren over at Love Lola blog asked if I'd like to contribute to her Spring Picnic menu (which includes some really lovely other bloggers and an awesome Picnic Basket giveaway!) and, of course I said yes, because I clearly love a picnic. Read all about the rest of the Spring Picnic menu, visit the other contributors, and enter the rafflecopter giveaway below! Bring a large pot of water to a boil over medium high heat. Fill a large bowl with ice and water and have standing by. Liberally salt the boiling water and blanch the vegetables. Add the green beans first and cook for 1 minutes, add the asparagus and cook for 1 minute, add the peas and cook for 1 minute. Quick drain the veggies and immediately move to the ice-water bath to chill. 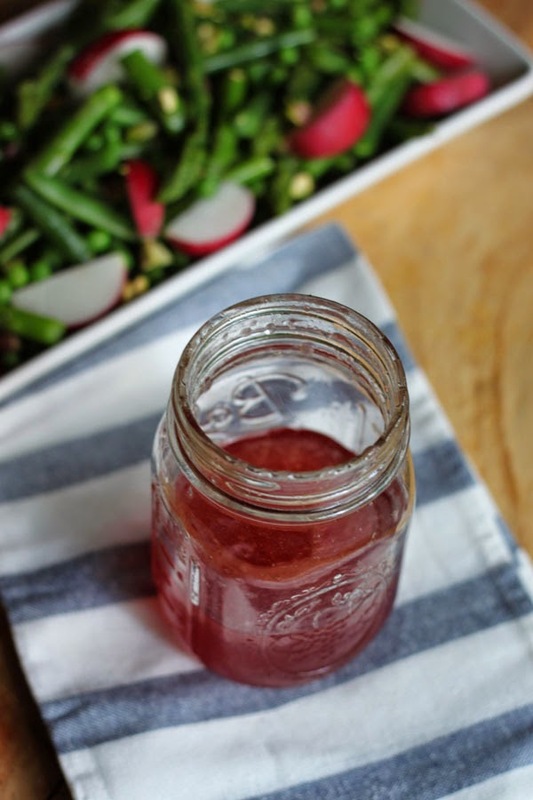 Make the dressing by combining the dijon, red wine vinegar, salt and pepper in a lidded jar. Shake vigorously and then add the olive oil, shake, taste and adjust the seasoning. You may want to add a teaspoon of sugar or honey - if you prefer a sweeter dressing. Remove the veggies from the ice bath and move to a serving bowl. 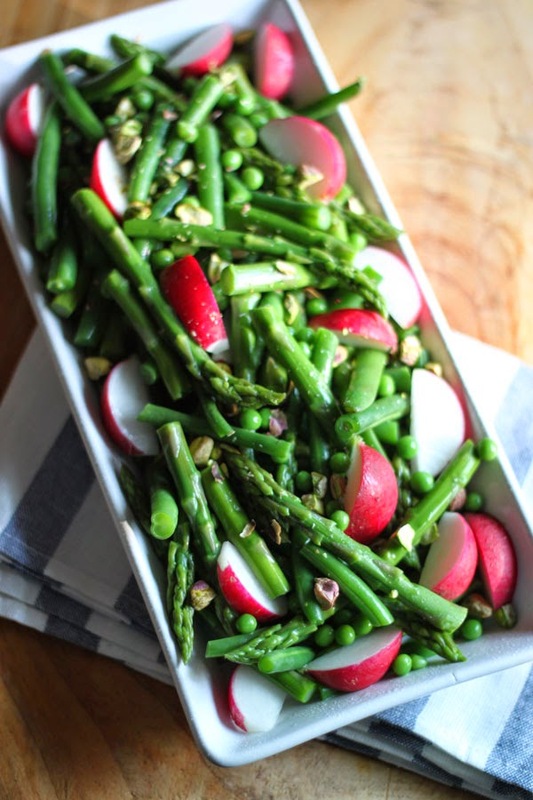 Add the radishes, pistachios, and dressing - and serve. Or chill the salad for 1 hour before serving. This salad can also be assembled the day before. Great green salad here.. I love anything with green beans so this is legit! That looks super yummy! I wanna make some for a picnic....if it ever stops raining. beautiful, meghan! this salad looks so delicious!